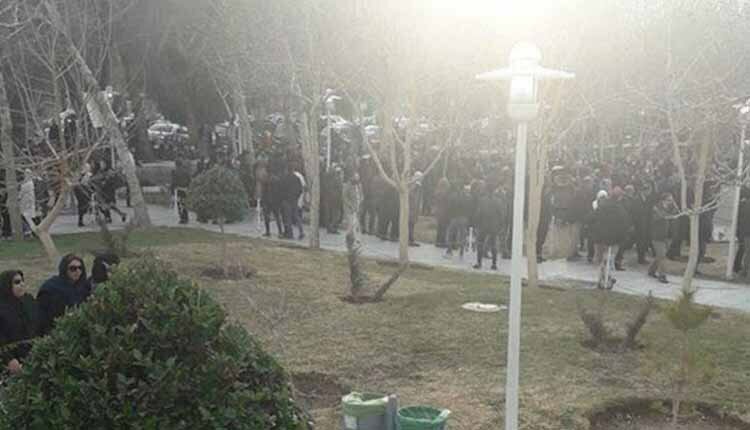 Security forces on Thursday attacked a peaceful rally of hundreds of teachers to disperse the crowds near the Zayanderud River in the central city of Isfahan. Hundreds of teachers and educators in Isfahan, central Iran, rallied alongside the city’s famous Zayanderud River on Thursday, February 7, protesting the regim’s unjust policies, including the drying up of Zayanderud’s waters, and demanding changes. Hundreds of people from other sectors joined and actively participated in the protests. The protesters had come out to demand that the government refrain from once again diverting Zayanderud’s water to other areas which had left the river completely dry. Other strata of the society had also joined the massive protest rally to demand that the Zayanderud water to be allowed to permanently flow into the river. Images shared on social media showed Isfahani teachers holding up pictures of jailed teachers demanding their release. Following this widespread rally, welcomed from a variety of sectors in the society, especially the teachers, authorities dispatched repressive units to disperse the crowd. The security forces were seen firing tear gas and using pepper spray in attacking the demonstrators. Iranian regime has a long and outrageous history of crackdown on peaceful protests.